All massage treatments are by a Registered Massage Therapist and, as a result, are covered by many extended health care plans. So go ahead and Relax - Refresh- Rejuvenate! Contact Kim Keresturi RMT directly via text at: 905 802 6210. We also have a 24 hour online scheduler for your convenience. Traditional massage techniques coupled with custom tailoring of the session to facilitate relaxation, calm awareness and deeper healing. Kim draws upon her knowledge and training in Reflexology, Pressure Point Therapy, Esalen Deep Tissue Massage, Reiki and Lomi Massage techniques to customize her massage technique to best serve the needs of the individual. Whether it is your first massage or your hundredth, you can trust you are in good hands. Enjoy the luxurious feeling of smooth, warm, basalt stones massaging your muscles and resting on your skin. The soothing heat of the stones warms and relaxes tight muscles. Stones of various shapes and sizes are used. You may have heated stones placed in specific points along your spine, in the palms of your hands, on your belly, or even between your toes to improve the flow of energy in your body. This massage will bring your relaxation to a whole new level. An aromatherapy relaxation body massage with Kansa wand for facial relaxation. Enhanced with a beautiful blend of essential oils to take you away! The bronze is a sacred metal alloy. Kansa (pronounced cuns) is produced from pure tin and copper. This blend of metals is known in Ayurveda, a traditional healing system in India, as "Healing Metal". A wooden, hand-carved handle makes using moderate pressure, delicate stroking or rapid friction easy on the face. Organic Jojoba oil, along with essential oils, are used in the massage, which helps the wand to glide carefully over the face, providing a warm, relaxing, and comfortable sensation. The Kansa Wand provides gentle friction to facial muscles which helps pull acidity from the tissues. If fact, as it is used on the face, oils will often get grey or black if acids are present in the skin. Tools like this have been used for centuries in India to enhance health and strength, and to increase energy, and reduce stress. They are believed to be essential to optimal health and well-being. 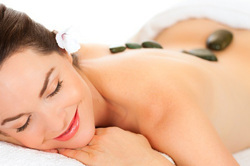 A deeply relaxing full body massage using soft hand-held heated sachets which mold to the natural contours of the body. These 'Thermal Palms' allow soft tissue to become more pliable and more responsive to deeper massage techniques. A great way to melt away any stress and tension. The best of both worlds. A relaxing massage with the energy balancing and healing effects of Reiki. Reiki is a natural, safe, effective hands on healing technique that helps restore equilibrium to the body's energy centers (chakras). When these energy centers are operating in balance, the body's ability to self-heal becomes restored. This treatment begins with a footbath and colour therapy. Continues with a cleansing and purifying facial which includes gentle lymphatic stimulation techniques and soothing massage to neck, décolté, arms, lower legs and feet. Incorporating Dr. Hauschka and other high quality body care products. Truly a unique and nurturing treatments. Castor oil packs can be used anywhere on the body to break up scar tissue and adhesions, soften masses, and draw out toxins from as deep as 4 inches. A castor oil pack improves elimination through the bowel, kidneys, and bladder, stimulates peristalsis, and protects the mucous lining of these organs. It improves absorption and assimilation in the digestive organs, balances acid secretions in the stomach, and stimulates the liver, pancreas and gallbladder. Castor oil packs have also been known to improve the function of the thymus gland and other areas of the immune system. Studies have found that abdominal castor oil packs had significant increases in the production of lymphocytes (Lymphocytes are the disease-fighting cells produced by your immune system and housed mainly in lymphatic tissue ~ including the thymus gland, spleen, and lymph nodes, as well as the lymphatic tissue that lines the small intestine.) Castor oil packs help improve lymph flow and drainage speeding up the removal of toxins surrounding the cells as a result improving organ function, and a lessening of fatigue and depression. They help the body to release toxins and help restore PH to a less acidic level. Inner Presence Coaching Sessions with Kim Coming Soon! !